Five Star PBW Cleaner - 4 lbs. Effective, but be careful. Iodine can stain a lot of things. I learned the hard way. Have used iodophor for over 20 years and a bottle last just a many years, my go to sanitizer ! Bottle goes a long way. Love the built in measuring cup on the bottle. Great fast sanatizer, but watch out if you soak non stainless or brass parts! My counter pressure bottle filler has non-stainless steel handles on the valves. If you soak these non-stainless parts in the IO overnight, the handles get a black mold looking sludge on them! Not sure how this happens, but anyway, do not soak extended times, "regular" metal parts in this! While using this product with good clean practices I have not had a contamination issue. With a frequent and heavy brew schedule, it took me almost two years to use up one of these jugs! 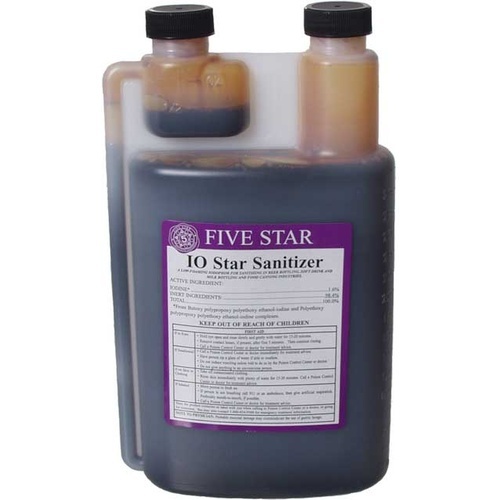 I tried a number of different sanitizers before settling on IO Star - each has their own advantages and shortcomings. Pluses: No rinse; doesn't attack flesh wounds (like some other iodine and chemical sanitizers will, quite painfully); does a great job; works for "iodine test" for mash conversion. Cons: Takes TWO WHOLE MINUTES of contact time to be sanitized (wow, what a painful wait! ); loses effect after time (don't use in airlocks or blowoff jugs and expect it to do much in a couple of days). Have used iodophor for over 20 years and have never had a problem with it ! need to clean your glass carboys ? this is the thing ! I clean probably more than a 500 GC !! worth it every penny save you time cleaning those painful GC!! most have !! best value for sure !! this thing work's like magic!! I clean almost every thing ! perfect to bottle it doesn't do any foam ! I really like this product ! most have ! I've used this sanitizer since day one of my brewing adventures. This sanitzer works as advertised and is a cinch to use. Just measure out the amount in the convenient integrated measuring cup and viola. This sanitizer is best for carboys (as opposed to starsan) because it does not make everything slippery like dish soap. When I used starsan on the carboy, the plastic stopper would not stay on, it kept on popping off because of the soapy water caused by starsan. Although it takes longer to work, it is great for everything including bottle sanitation..especially if you fear the foam! I've used IOStar from FiveStar for years. Sure you can use bleach but IOStar lasts, is quick acting, is food safe, and will NOT impart flavors into your brew like bleach can. Buy the BIG bottle so you don't have to pay shipping over and over and you'll thank me later.... Cheers! I like to use this for foam free bottling and use Star San for everything else. After using pbw to clean, i use io sanitizer to sanitize. Much better than using bleach. Easy to dispense. Cost effective enough. Plastic tubing does discolor plastic tubing but does not hurt function.